If you want to travel somewhere in Africa then consider Ethiopia. The famine was over years ago and Ethiopia today is a fascinating fusion of ancient sites, modern growth, incredible and diverse natural landscapes and a history that is quite overwhelming. 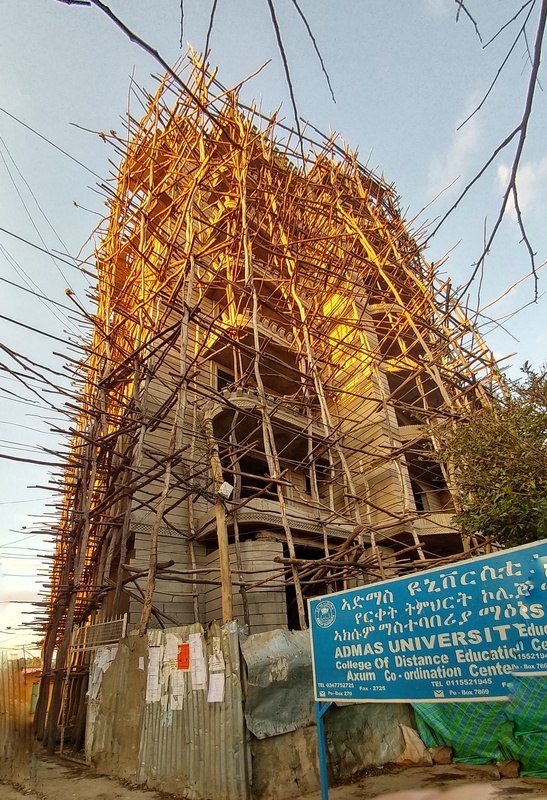 Addis is a vibrant clash of colour and culture, mixing the old and the new with ease, creating a truly African city. 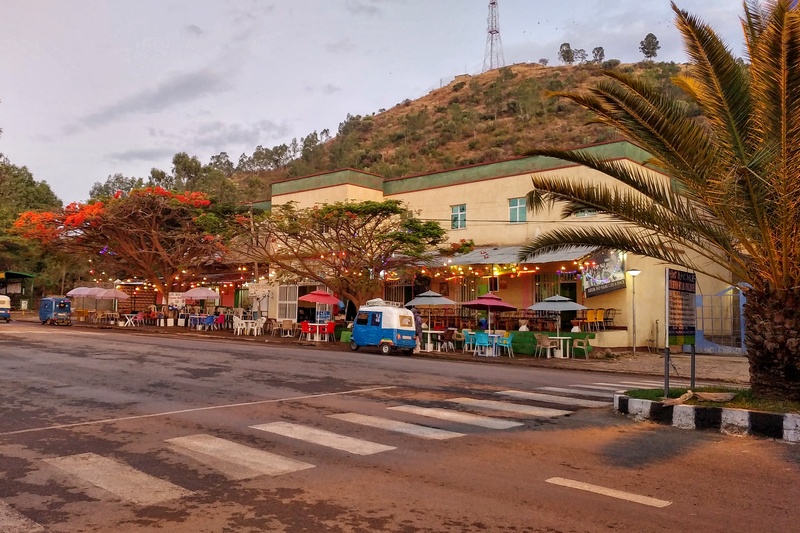 Coffee brewed on the side of the road and sipped while browsing the bustling markets downtown is as enjoyable as a cappuccino served in the quiet sophistication of the upscale Bole Road and gleaming Piazza. Smart cars share the roads with scooters, bicycles and the occasional donkey, there is space for everyone in Addis. A visit to the National Museum to see the fossilized remains of Lucy which date back to about 3,5 million years ago is interesting, but many of the other exhibits lack explanations, so it is best to visit with a guide. The Ethnographic Museum at the University is more contemporary in style and very informative, making it is a good start to understanding the many facets of this country. 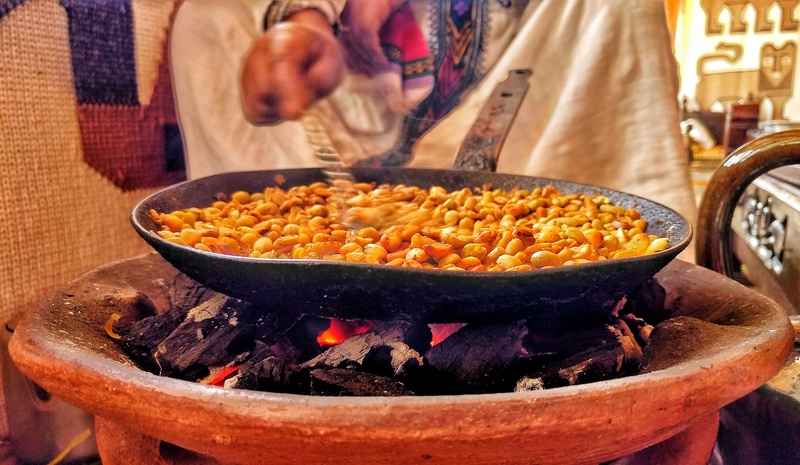 Spend an evening at Yod Abyssinia for traditional Ethiopian fare and the fascinating cultural dancing. Tribes focus on different body parts, some using mainly the shoulders, others the waist, hips, legs or feet. The movements are intricate, highly energetic and very compelling to observe as they seem to almost dislocate their joints in a staccato manner. Much of the dancing starts slowly and builds to an almost manic crescendo of whirling, leaping, stamping and head-banging. I loved this city even though it left me with many more questions than answers. 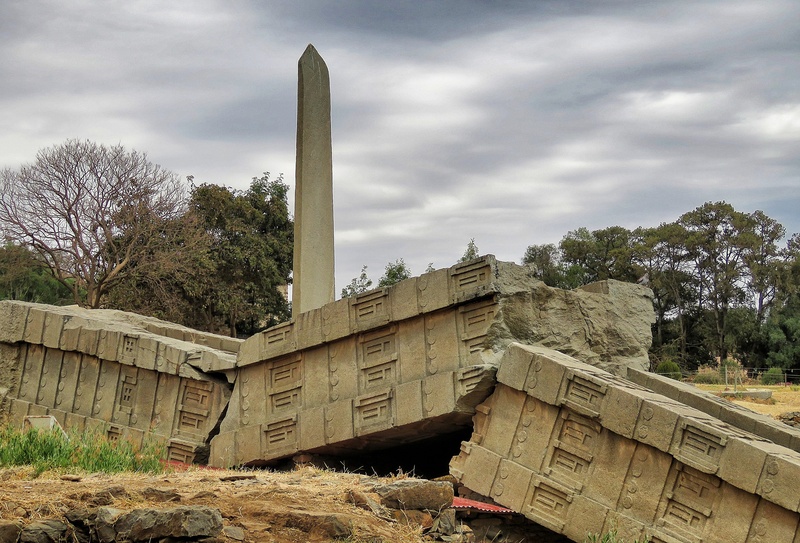 Established around 7BC , its history is confusing to say the least and includes Ethiopian versions of Biblical Old Testament characters, and a collection of inexplicable obelisks. 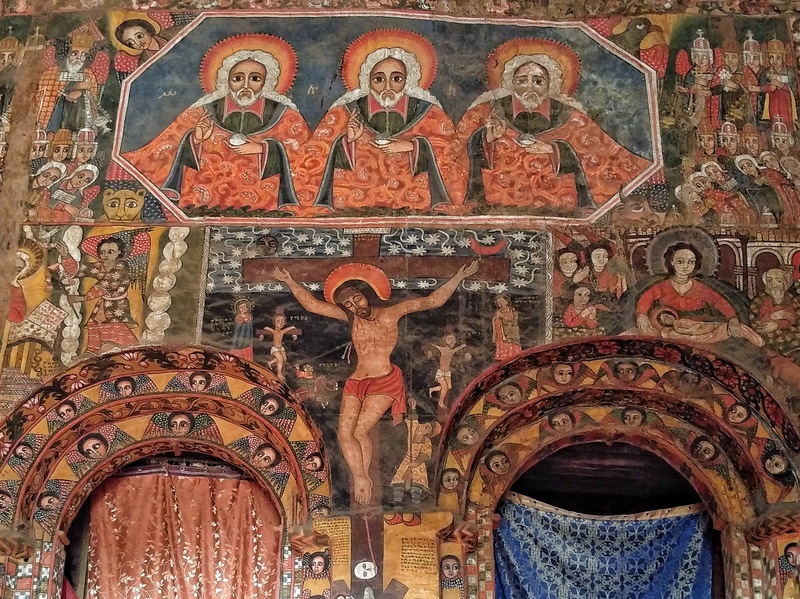 The Church of Maryam Tsion is a round, domed church filled with brightly coloured paintings depicting religious scenes. Devotees knelt in prayer at the altar, tourists listened to animated guides and in the centre of the church men climbed up and down the scaffolding repairing the ceiling. In spite of all this I found it a very spiritual place. Stelae Park is opposite the Church of Maryam Tsion. It is an open piece of ground surrounded by a low wall in the middle of the town. Giant stelae (obelisks) weighing hundreds of tons rise to 10 stories high. Perfectly proportioned and intricately carved from rock quarried some four kilometers away, it is impossible to imagine how these were built and transported. A fallen stela weighing an estimated 520 tons, the equivalent weight of about 120 elephants, is thought to have collapsed while being erected way back in the 7th Century. The ruins of Dungur Palace glow in the late afternoon light and the ancient rocks keep the secrets of the past. The story goes that this was the palace of the Queen of Sheba, who had a love affair with King Solomon. They produced a son called Melenik who stole the Arc of the Covenant from Jerusalem and brought it to Axum. The Arc is a gold plated chest built in 6BC to house the tablets containing the 10 Commandments, and according to many Ethiopians, is now under lock and key in the treasury at the Church of Maryam Tsion. 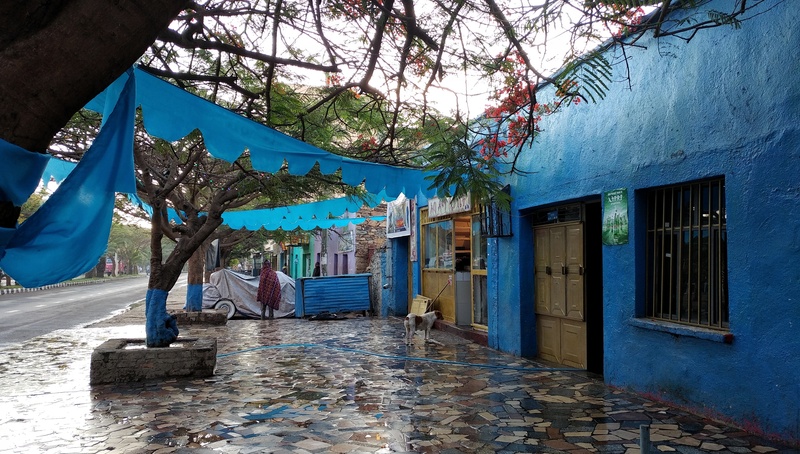 Walking through the town at sunrise I was enchanted by the everyday side of the city as hundreds of men, many clothed in white robes and multi-coloured scarves, walked towards the square hoping to get taken on as a labourer for the day. Shop owners swept the front of their stores, coffee vendors set up their roasting brazziers, boys played football in the street and a young man groomed his donkey before loading up his cart. The drive from the airport to this sacred site is a laborious uphill climb and a reminder of the vastness of this country as the road twists and turns higher and higher into the mountains. The sites of the monolithic and rock hewn churches feels like a place lost in time. The dominating colours are the orange red of the rock and the bright white of the robes of the priests and worshippers. 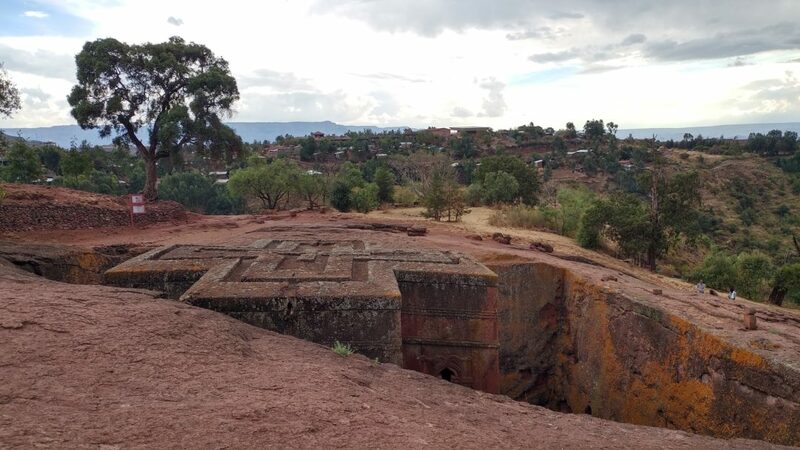 During the cooler hours of the early morning, Lalibela is a quiet and spiritual place untouched by modern times. Later in the day it becomes busy as tourists arrive. The monolithic churches at Lalibela are almost incomprehensible. Thousands of workers took 26 years and 6 months to create 11 churches, many linked by underground tunnels. Four of the churches were built by first disconnecting the rock by chipping a channel all the way around it and creating a water drainage system. Then the remaining rock was carved into an intricately decorated, perfectly proportioned church with many rooms and alcoves. It is said that while the labourers slept at night, angels worked under the stars on these architectural wonders. 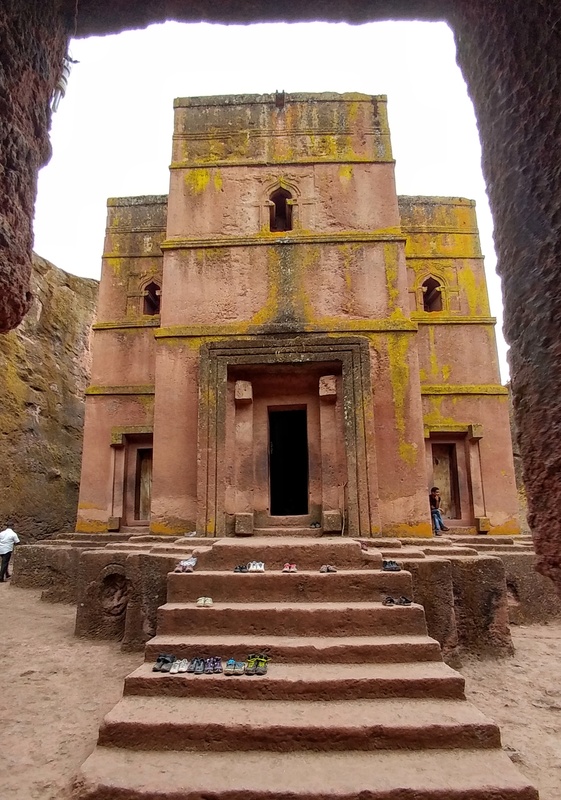 Allow at least two full days to explore the 13 churches here, one day with a guide and one day to wander at your own pace, walking through the tunnels that link the churches and observing and absorbing the magnificence that is Lalibela. The most impressive of all the churches is the Bet Giyorgis. Seen from ground level the roof is in the shape of a cross. Looking over the edge, some 15 meters down is the base of this monolithic church. The entrance fee is about R600 but it allows access to all 13 churches over a 5 day period. 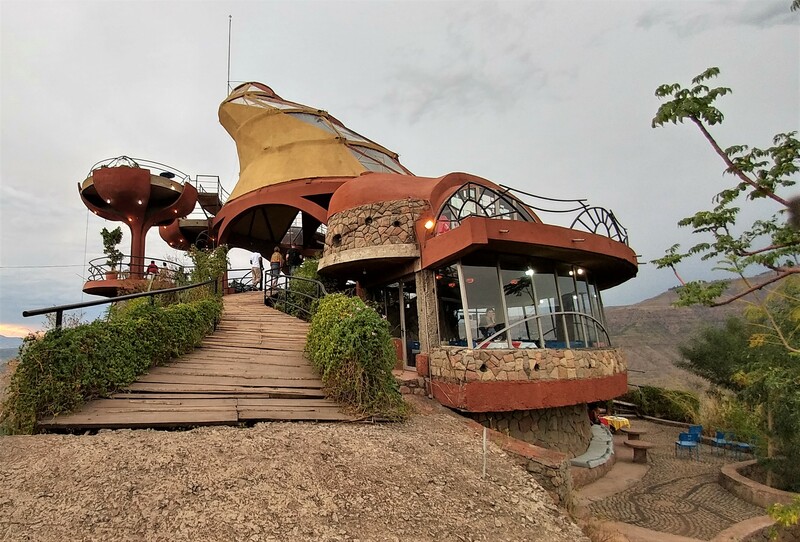 Perched on top of the hill, this fanciful design and open air restaurant / pub is worth visiting for the views and architecture. Stairs spiral, mad arms jut out and open onto circular decks and the views down the valley go on for days. Established in 1635 Gondar could be considered a new city by Ethiopian standards. The Medieval Castles within the UNESCO Heritage Site of Fasil Ghebbi conjure up images of jousting knights and damsels in distress, but actually provide insight into the lifestyle of the popular Emperor Fasilidas. 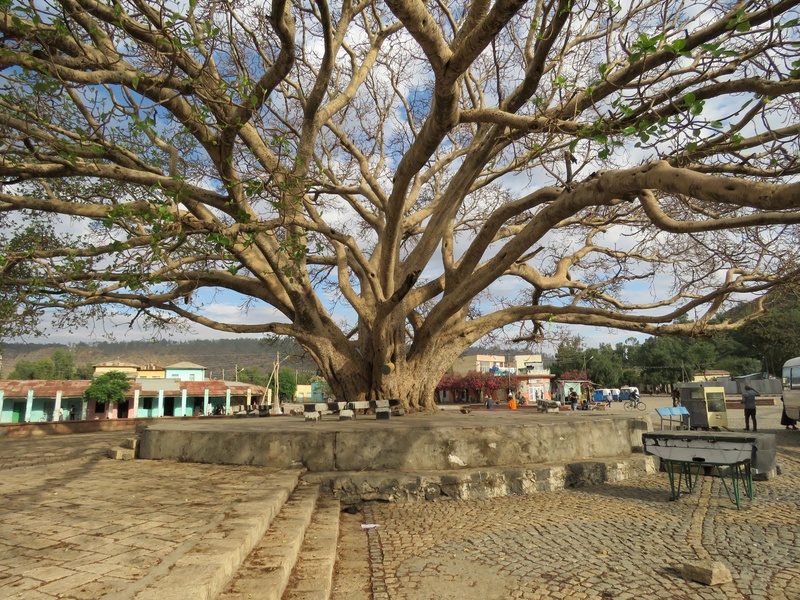 The tiny church and monastery of Debre Berhan Selassie was the one I found the most spiritual. The dark interior was silent, patterned cloths and earthy coloured paintings adorned the walls and a few chairs served as pews. The faces of 80 identical cherubs looked down from the ceiling. Download Betternet to assist in connecting to the internet. A cappuccino is R10.50 , while R13.50 will buy you 500ml of local beer or 330ml of imported brews. Ethiopian Airlines offers 1 direct flight a day from Cape Town to Addis Ababa, a return ticket in will cost under ZAR9 000. Johannesburg has 3 direct flights daily to Addis. 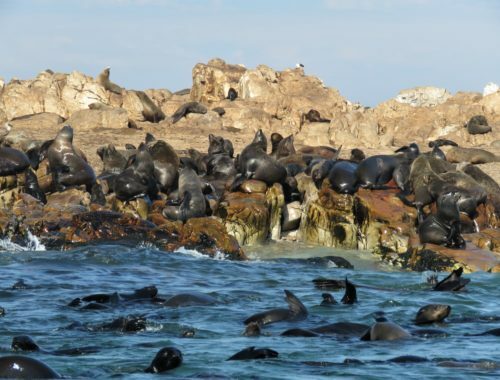 Flying time is five and a half hours and a return ticket is around ZAR 7000 or less. Use the Ethiopian Airlines Mobile App to manage everything from booking your flight to checking in and getting your boarding pass, and accessing flight information updates and schedules. Ethiopian Airlines is the fastest growing airline in Africa with seventy years of successful operations, and a host of International and African awards and accolades to its name. Part of Star Alliance it flies to over 100 destinations around the world. This article first appeared in Traveller 24. Here are a few more pics of some of my highlights.